More of the same - in the best way. The game that rekindled my fire for strategy RPGs is back, and this time on the PlayStation 4. It may look the same on the surface, but the deeper you go the more in depth this game goes. The story, as in the other games of the series almost an after sight, and certainly not the main portion of the game, the game focuses on the craziness that comes out of Japan. The combat in this installment is again, more of the same, you have the basic set of weapons (sword, axe, staff, gun, bow, staff, fist, and monster weapons) you have your story heroes, your generic characters that you can create, monsters, and your basic SRPG tile-based turn-basted battles. Geo panels, field effecting (positive and negative) panels are back, plaguing some levels, also creating the ability to quickly level. The weakest point of this game, as with previous installments, is the sound and music. The overworld music when you’re just walking around your base is truly atrocious, and the voice actors in this are some of the worst in the series. Thankfully, you can change the background music (BGM) of the overworld, and I did, but the voice actors are there to stay, unless you go to the Japanese voice actors, but those are not much better. It is something you just come to live with, but it is the weakest point of this otherwise great game. If you are looking for a jumping on point to Japanese RPGs, Strategy RPGs, or isgaea in general, there are worse installments than this one. Also, given how this is the first on the current generation of consoles it is a sure fit. 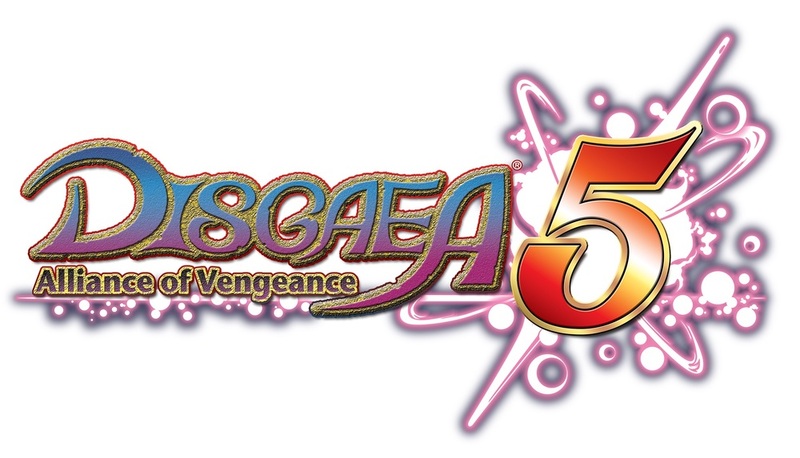 Currently, the previous installments are not available for the PS4, but remakes have been made for the PS Vita. Sorry for the length between reviews; Destiny stole my soul for the month of September - a review is forthcoming for that as well - but I managed to wrest control of my soul from the maw of Destiny and make a triumphant return. Anyway, Warriors Orochi 3 Ultimate was originally released on the PS3 and Vita on September 26, 2013, with the PS4 version released on September 2, 2014. This review comes based on the PS4 version of the game. A bit of backstory on this series. 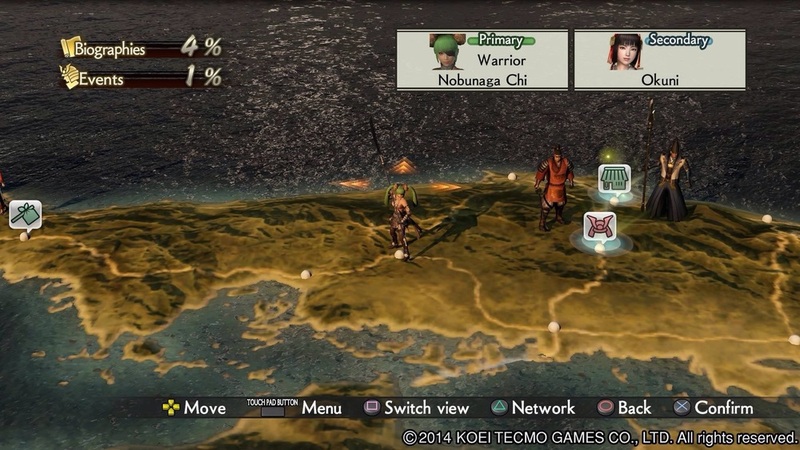 The Warriors Orochi series is a cross-over of the Dynasty Warriors and the Samurai Warriors franchises. As such, it features popular characters of both, as well as very similar gameplay elements. Not having played the WO series prior, I wasn't too familiar with the storyline of the series, but they give you a short introduction before the first mission to bring even veterans of the series up to speed. However, despite my lack of background with WO, I knew about what I was getting into when entering this game due to my history with the Dynasty Warriors property. If you've played any entry into any of the three properties involved here - DW, SW or WO - then you're familiar with the gameplay. You play a main general whose sole job is to cut swathes of enemies apart. The PS4 entry is especially sweet, due to the sheer processing power of the system, bringing untold hundreds of AI enemies onto your screen at any time. 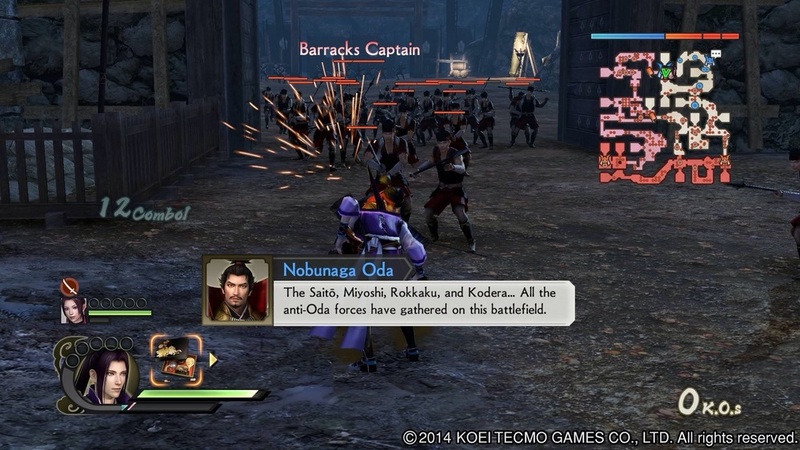 Also, WO uses the weapon system from previous games in a unique way: Instead of switching weapons, you switch between generals, each with their own moveset and flair. This allows you to keep combos moving nearly indefinitely, only failing to continue when you run out of fodder to destroy. 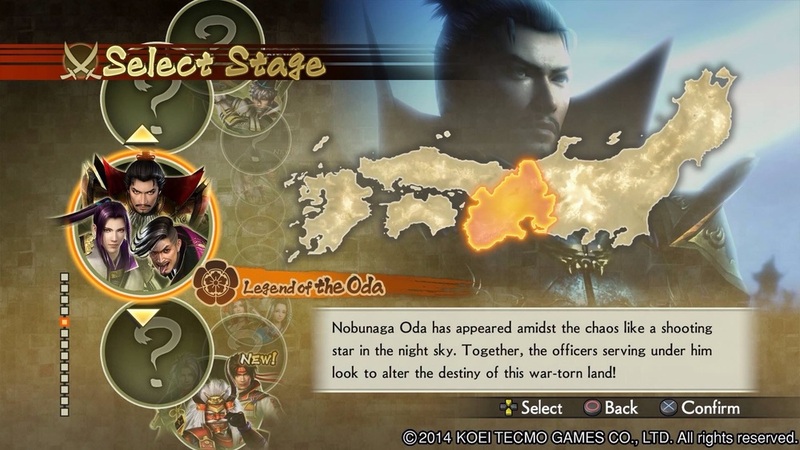 The story for WO3 follows years after the events of WO2, in which the titular Orochi is finally killed. The opening mission in WO3 is based on the Hydra, a megabeast destroying its way through the warriors in the world. You are a leader in a coalition army that attacks the Hydra's base of operations, and your job is to kill it. Unfortunately, it further massacres your army, and you are forced to flee. When all seems lost, the remnants of the army are rescued by the goddess Kaguya, who uses her powers to allow the heroes to travel back in time and save their comrades from their deaths. The above screenshot shows the camp, your base of operation during Story Mode. Here, you can chat with the other officers you have access to, and you can also use the Blacksmith you can see in that picture to upgrade your weapons and buy more to further upgrade them. Adding in Sockets and Attributes to fill those sockets, the relatively simple system becomes somewhat more complicated. There may be special weapons and attributes, but I have yet to encounter any just yet. 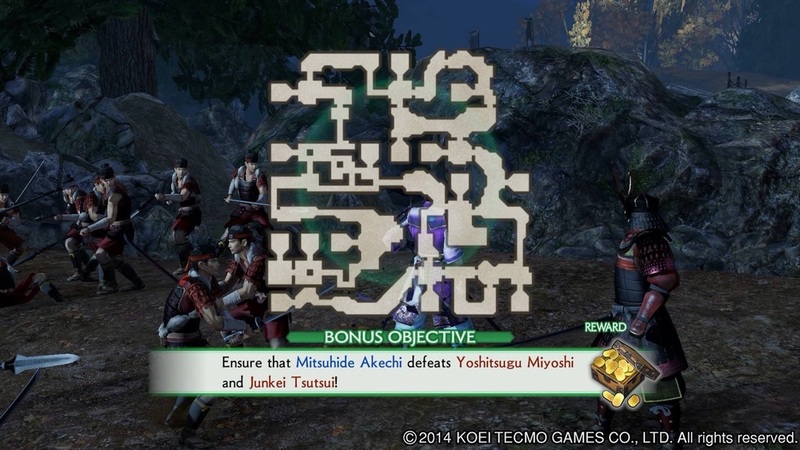 After leaving the camp, you are able to choose your mission and are taken to a very familiar screen for veterans of the series. Here, you can change weapons and accessories on your characters, take a look at each army's members, and accept side missions that are are to be completed during the mission. It also shows a map of the battlefield and you are free to begin planning your route of attack, if you so choose. Finally, hitting Begin Battle takes you to the actual battlefield. Again, for veterans of the series, this comes as nothing new. The map from the Preparation Screen appears again - and is very helpful in thwarting the opposing army's movements, since it shows every move made by any member of any army and will end up being one of your main weapons against the enemy. The battlefields each have their own win conditions, but I've always been partial to the 'kill all of the things' condition which, while it may take a while, is not only satisfying but also ensures optimum experience gain for the team you took into the mission. It's rare, but enemy commanders can drop an item that puts you in a state called "EXP Fever" in which every enemy killed drops an EXP satchel, which vastly increases speed of leveling and becoming stronger. Verdict: If you are a fan of the Dynasty Warriors franchise, Warriors Orochi 3 is a very solid entry to the genre. It's quite satisfying to rack up thousands of kills in the span of a battle, and the harder difficulties are challenging enough to make even the highest level characters sweat in the course of each battle.